Savoring Time in the Kitchen: Snowed In? 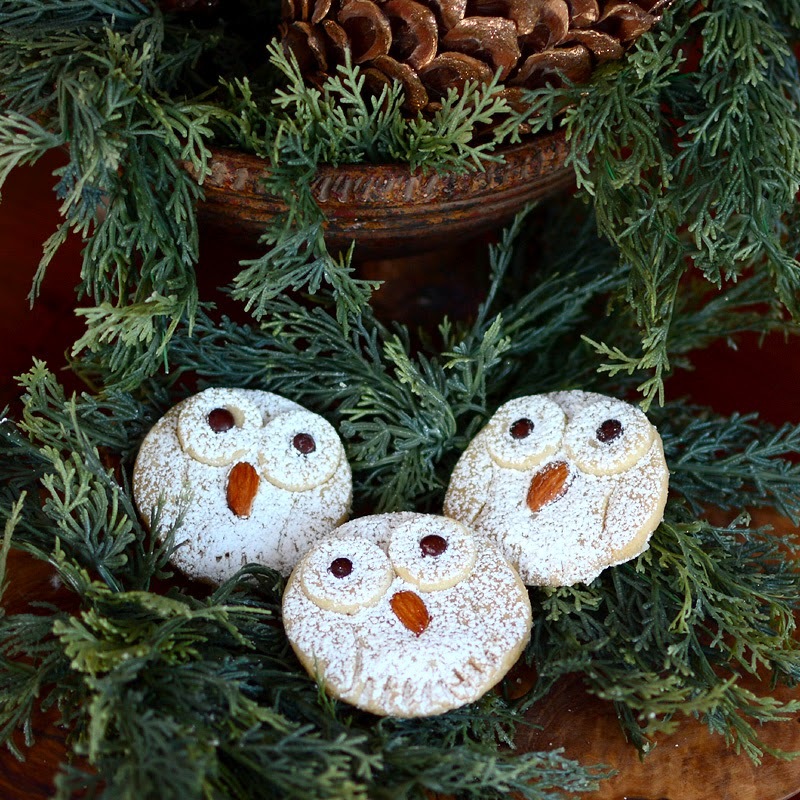 Make Snowy Owl Cookies! Snowed In? Make Snowy Owl Cookies! Happy New Year! May it be a happy and healthy New Year for you all. Here, the scene outside remains the same as in the first photo of my last post with the addition of about 5 more inches of snow today with the potential for another 5 inches tonight into tomorrow! I know the Northeast part of the country is bracing for a huge snow storm. What a winter so far! If you get stuck indoors, have little ones or grandchildren to entertain or just want to have a fun baking experience, try these Snowy Owl Cookies! I used a classic shortbread cookie recipe but you can also make these using your favorite sugar cookie cut out recipe. You'll need some round cookie cutters. I used a 2-1/2" round cutter for the body and one about 1" for the eyes. Since I didn't have a 1" cutter I used the base of a clean travel lotion jar. Mini M and Ms were used for the eyes. For the beaks, rather than using whole almonds, I VERY carefully split the whole almonds in half lengthwise with a butchers knife. Use a fork to make the imprint of the owl's feet and a butter knife to etch the wings. Bake according to the directions. Allow them to cool for 5 minutes and then sift powdered sugar over the top. I used a slightly damp cotton swab to wipe the powdered sugar off the eyes and beaks. There are lots of other ideas for owl cookies on Pinterest! Place the softened butter in a stand mixer. On low speed, add the sugar a little at a time until thoroughly combined with no gritty feel. Add flour a bit at a time until all is absorbed. This should yield a soft, workable dough. Turn out the dough onto a lightly floured surface and knead until smooth without cracks appearing. Roll out to about 1/3 to 1/2 inch thickness and cut into shapes. Gather and re-roll scraps. If dough gets too soft, refrigerate for a while. Place shapes on a cookie sheet covered with parchment paper or a silicone mat. Chill for about 20 minutes before baking. (It's chilly enough here for me to put them in a protected place outside). Preheat oven to 325 and bake for 12-15 minutes depending on the thickness of the shapes and your oven. They should be just slightly brown around the edges. Cool and store in a tightly covered container. May be frozen. Lovely! We saw a snowy owl at the beach a few weeks ago. Stay warm and Happy New Year! These owl cookies look so wonderful, Susan. Have a blessed and joyful New Year! Perfect! Your weather seems to be my weather. If the report is correct, I'll have days to make snowy owls and whatever else I can find the ingredients for! Snow plows were at work all night in the neighborhood. Our street seems to be the turnaround to loop back up to the city square. It's o.k.. Nice to have the streets constantly cleared. They are a hoot you are right.. so cute..I bet M and D's eyes lit up..as well as the bigger people.. Very cold here..fire's already going..
Looks like you guys are starting the new year with some serious winter weather - first the snow then really cold. I believe making snow cookies sounds like the right activity. Lovely Susan! have a nice and wonderful New year!! Hello Susan I hope thing are good with you and the family and that your Christmas and new-year was great /These owl cookies look so adorable! and I can't say no to making these cute adorable Owls and thank you for the recipe! Happy New Year, Susan. I have been in Chicago since the week before Christmas and can't believe the amount of snow I've seen. It's been fun, but now I'm hoping I can make it back to the Pacific NW on Saturday. Your little owl cookies are so darn cute - I've pinned them and can't wait to make them for my grandkids. Very cute! Wonder how the grands might interpret them! Those are so cute and bet they are yummy also as I prefer shortbread to a lot of the other sweeter cookies! I need to send this to daughter as she is is on an Owl kick these days. Would not want your weather here - ours is bad enough with the extreme low temps (at least for here). How CUTE!! They ARE a hoot...pun intended, of course. Ms. C. will LOVE helping to make these. Thanks for the details on how you created them. This is the first time I've seen owl cookies, ever. So very cute and owls are timelessly popular. You sure were creative in bringing these adorable snowy owls to life ~ every detail is perfect! Wishing you a very Happy New Year and looking forward to another year of visiting your lovely blog! I bet those little owls just melt in your mouth. They are so adorable nestled in the greens of the trees! I hope you have a prosperous and happy New Year! I wish to you and your family a very Happy and Prosperous New Year Susan! These cookies are so, so cute! 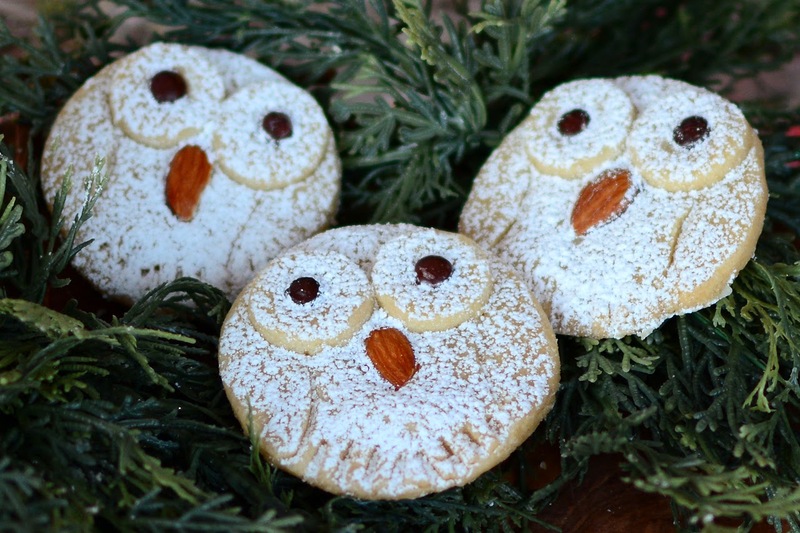 Your snowy owl cookies look amazingly delish! I am sure, if my kids get to see these, I have to bake them immediately. Very pretty! 'Hoo' else could possibly create such adorable owl cookies! Susan, my Sam loves owls too, so I'll have no choice :) but to bake a batch of these just for her. I'm so glad you made them so I can drool and admire! Great job, and I just pinned them to remind myself to make them soon. Okay...these are just THE CUTEST. Happy new year love! These cookies are adorable! Perfect for any little boys birthday parties. Happy New Year Sue! so cute and delicious cookies, have a nice weekend Susan, a warm hug ! The snow owl cookies are adorable! Very cute. The winter weather is crazy. Stay safe and warm. These are just precious! All of my Chi Omega friends would adore these. Oh, those are darling! I love shortbread! Even though I am in Southern California and nowhere near snowed in, I think I am going to make these. What a great idea and how cute ! We are not snowed in but it is biting cold with a horrible wind. Waiting for the winter to be done! These are so cute and lovely! A lovely and creative idea, and to keep the kids busy while having fun! Wish you a wonderful winter!